Hummingbirds visit Houston for several weeks in the late summer/early fall during their southern migration, and they stop by briefly in April on their way back up north. For the past few years, I've put out several feeders on the back porch. 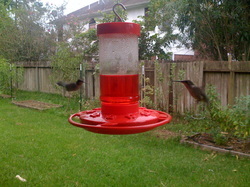 When Hurricane Ike came through, the hummers disappeared for just a few hours, and then they came right back. We've had up to 25 hummingbirds swarming our backyard at one time. I always worry that they're not going to come, but they always do. One thing I've learned that if you feed a hummingbird red nectar, they poop red. Our electricity was out for two weeks after Hurricane Ike, so I rigged up a clothesline in the backyard to dry my laundry. When I went out to take it down, I noticed lots of little pink streaks on my white shirts. The humming birds had been drinking the red nectar, and then perching on my clothesline and pooping on my shirts! Now I just use a plain sugar-water solution instead of buying the nectar. It's cheaper and better for the birds, although you have to change it out every other day because it doesn't have any preservatives in it. 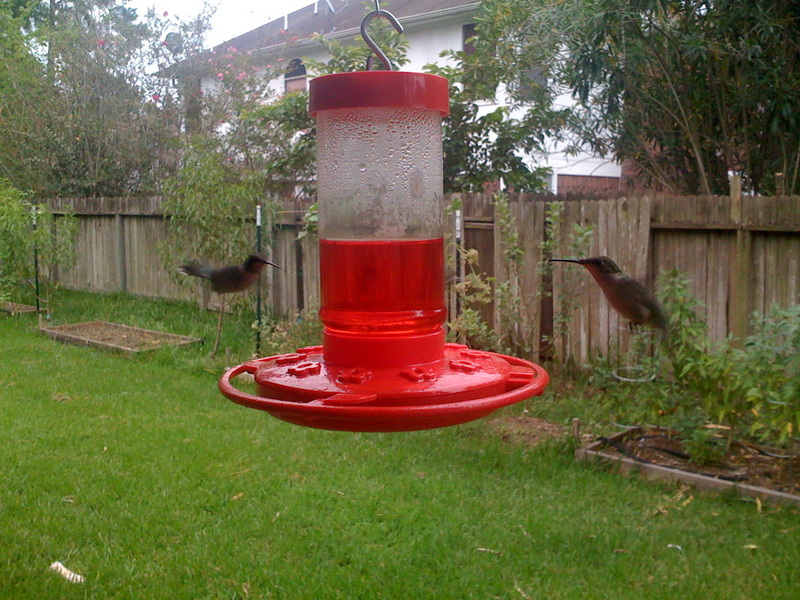 The hummingbirds don't care what color the liquid is, as long as there is red on the feeder. More information can be found at Donald Burger's hummingbird web page. I've decided to follow his example, and start keeping a record of when the hummingbirds visit our yard. Fall 2012 - First hummingbird sighted on August 13th at 6:30 am. I put a feeder out on July 31st, just in case they were early. I plan on putting out several more feeders around the deck and on the play fort this week. I hope they stay around a long time this year. Spring 2012 - I looked and looked, but didn't see a single hummingbird this spring. Fall 2011 - First hummingbird sighted on August 14th at 11:30 am. I had the feeders out since July 30th. They stayed around for a long time this year. The last one I saw was around mid October. Update, I saw one female hummer visit an old feeder in late November. 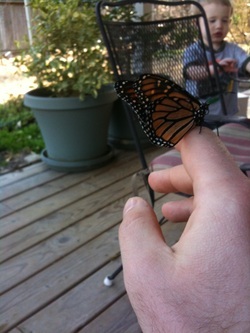 I immediately sprinted into the house to mix up some fresh nectar for her. No more sightings after that. Spring 2011 - First hummingbird sighted on April 23rd at around 2:30 pm by the coral honeysuckle. I had been out of town the whole previous week, so they may have been around sooner. I immediately ran to the shed and filled up two feeders. 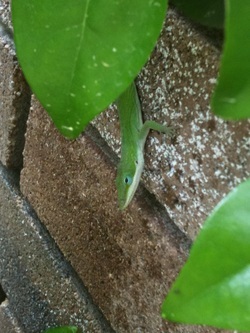 I'll keep a watchful eye out for any more. 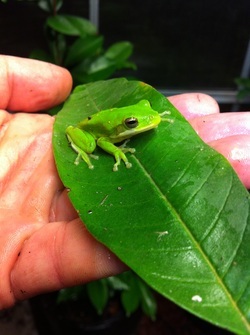 Donald Burger saw his first hummingbird on March 19th, so they've probably been around. Fall 2010 - First hummingbird sighted on July 31st. They stayed until the first cold from came through in late September, and then they were gone. In addition to hummingbirds, I also try to garden to attract butterflies, bees, beneficial wasps, lizards, etc. I want my backyard to be alive. My boys love to chase the monarch butterflies around the porch, and we all like watching the caterpillars eat, grow, and metamorphose into butterflies. 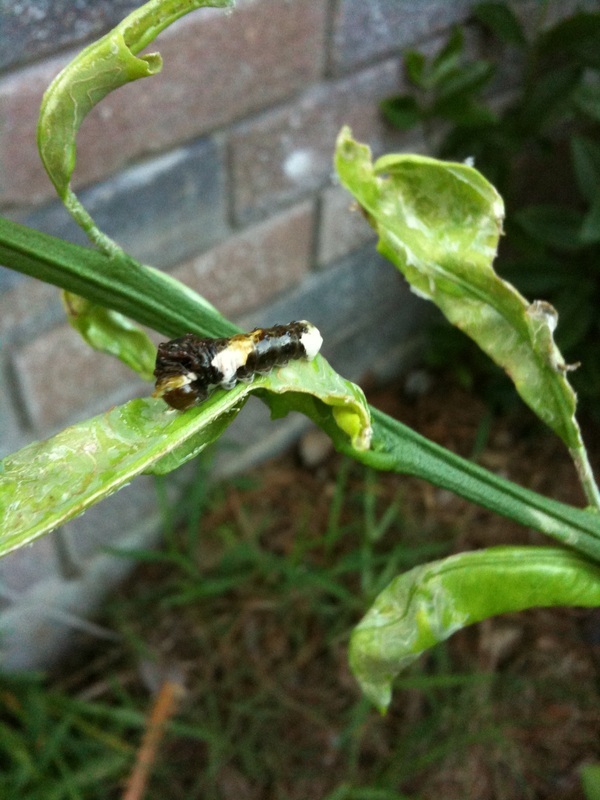 I love seeing the giant swallowtail butterfly (largest in North America) lay eggs on my citrus and avocado trees, and seeing them hatch into the orange dog caterpillar (looks like bird poop). 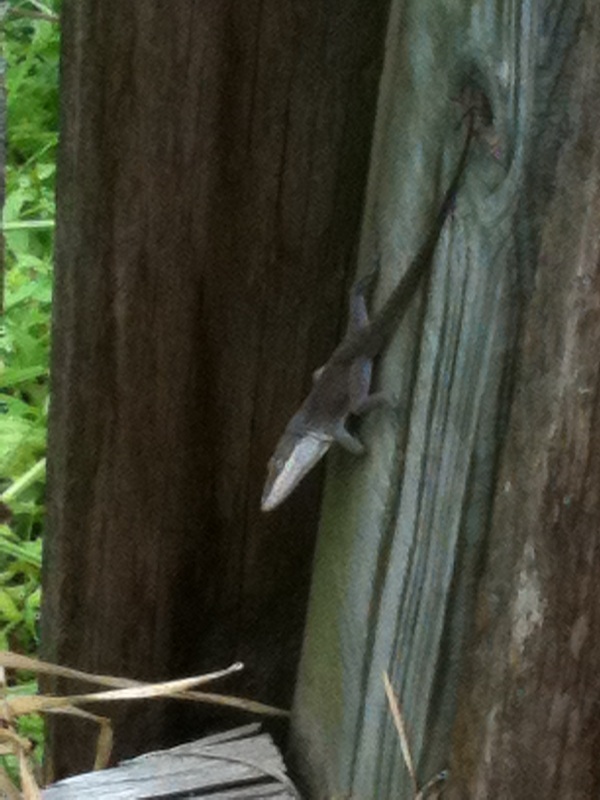 I also get woodpeckers, brown bats, anoles, geckos, toads, and all sorts of songbirds. Whenever I get some more free time, I want to build some birdhouses and bat houses to put up around the yard. For the time being, just keeping the birdbath full is enough to keep the birds coming around. I've got two big pine trees in the back that will be perfect for mounting birdhouses. I'll post pictures when I do. 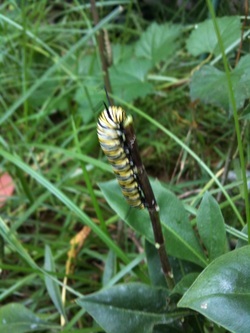 Monarch caterpillar defoliating the Mexican butterfly weed. 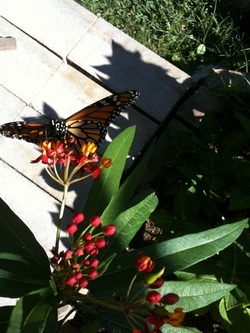 Monarch butterfly getting a drink. 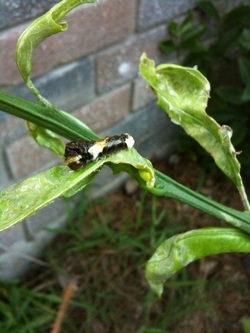 Orange dog caterpillar chomping on my Okistu Wase satsuma. 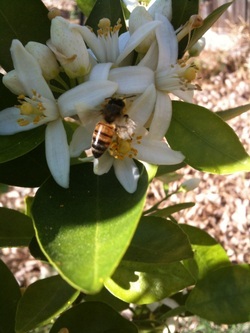 Honey Bee pollinating citrus blossoms.